Treating stroke requires attention not only to patients’ physical needs, but to their psychiatric needs as well. Unfortunately, there has been a considerable lack of literature that tackles this important facet of recovery. The Psychiatry of Stroke fills this void through a comprehensive examination that explores the mental and physical issues faced by stroke patients and offers up-to-date treatment options. Based on extensive clinical experience, the text offers practical advice for improving the treatment of stroke by increasing the attention paid to its mental aspects. Detailed and definitive, this unique text demonstrates how mental impairment sets limits to stroke treatment and rehabilitation and shows how to evaluate and treat these impairments. Accessible to a wide range of readers, this new edition presents detailed reviews of classical papers as well as more basic outlines that provide a general overview. Regardless of familiarity, readers will find comprehensive and authoritative guidance for improving treatment. The Psychiatry of Stroke also includes a wealth of informative tables and diagrams as well as a full glossary of terms. Extensively referenced, this important text also provides useful appendices that look at resources for caregivers and the anatomy and historical significance of stroke. 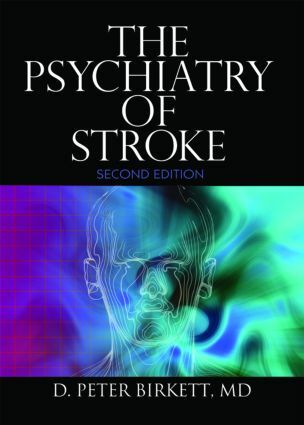 Physicians and mental health professionals who treat stroke patients; staff of stroke units and rehabilitation hospitals and centers; fellows in geriatric psychiatry, geriatrics, and stroke programs; gerontology students and educators; and families of the victims of stroke or vascular dementia will find this book an invaluable day-to-day resource.